Online Journal of the Institute of Health Sciences Bhakti Wiyata Kediri is an online publishing system based on the Open Journal System published by Institute for Research and Community Service Institute of Health Sciences Bhakti Wiyata Kediri. 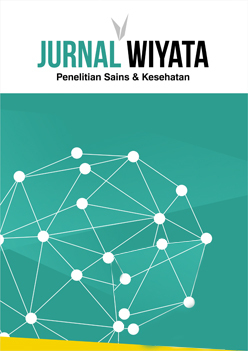 Wiyata Journal Research on science and health is a periodical journal published by the Research and Community Service Center (PP2M) Institute of Health Sciences (IIK) Bhakti Wiyata Kediri with ISSN number 2442-6555 (online) and ISSN 2355-6498 (prin). This journal contains various scientific articles relating to science and health. The scope of the journal includes health biology (biomed), health chemistry, environmental health, pharmacy, dental health, health analysts, physiotherapy, nutrition, public health, natural materials, microbiology, virology, serology, parasitology, public health management, nursing, and midwifery . The wiyata journal of science and health research was first published in 2014 and received the ISSN in 2015 with volume number 2 no 1. In the course of this journal it has been published regularly, although it is constrained by the number of manuscripts that will be published and the timeliness of publication. Each article that goes to editorial staff will be selected through a Preliminary Review process by the Editorial Board. Then, the article will be sent to the Sustainable Partner / peer reviewer and will proceed to the next selection with the peer-Preview Process. After that, the article will be returned to the author for revision. This process takes one month. In each text, peer reviewers will be assessed from the substantial and technical aspects. The final decision to receive the article will be made by the Editor's Board in accordance with Reviewer comments. Authors who wish to submit their manuscripts to the Journal if scientific and health research must comply with the writing guidelines. If the text sent does not comply with the guidelines or is written in a different format, it will be rejected by the editor before further review. The editors will only accept manuscripts that meet the specified format.